62 minutes: Die off, Drogba on. 64 minutes: Bony scores. 66 minutes: Gervinho scores. The stats will tell you that Ivory Coast’s captain wasn’t directly involved in Ivory Coast’s two goals, but anyone who watched the game will tell you his introduction was a game-changer. Before that, Les Elephants had clearly been on top in the game but were struggling to create or take clear-cut chances. Wilfried Bony had looked bereft of confidence in missing a couple of free-headers, while Gervinho was having another of the erratic games that makes him one of the most frustrating players to watch in the world. Japan were certainly no great shakes – as Martin has already said, they lacked alternatives in attack and began to drop deeper. Maybe they would have conceded eventually anyway, but defeat for the Samurai Blue seemed unlikely. But Drogba’s appearance had two effects. Firstly, it revitalised an Ivorian attack that was beginning to flag and lose faith. It seemed as if they were heading for another defeat at the World Cup, this one being particularly damaging one as it would make qualification for the knockout stage very difficult. As in 2006 and 2010, it seemed destined that they would once again be remembered for underperforming on the biggest stage. The players seemed to be believing it, let alone the fans back home in Abidjan who had stayed up until the early hours to watch their team play abject football. The other effect Drogba had was to rattle the Japanese defenders. Faced with the ultimate big game player, a huge physical presence and wonderful technically-gifted star who was lifting his own team mates, they were suddenly nervous, and it showed. Bony and Gervinho both found space to head in two exceptional deliveries from Serge Aurier, and Japan never looked like equalising. 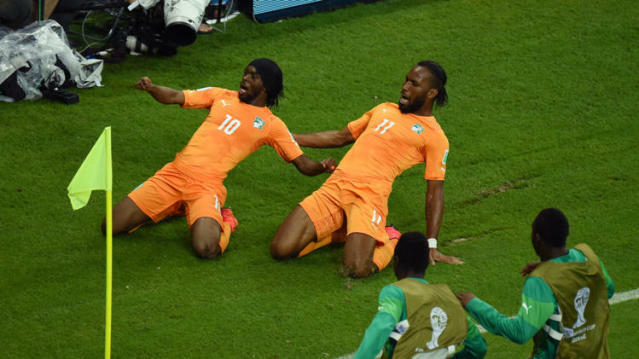 There were a handful of negatives for Ivory Coast, namely the space Honda got to fire in the opener, and a tired-looking Yaya Toure’s lack of influence on the game. They will also sweat on the fitness of Arthur Boka and substitute Didier Ya Konan, who both picked up knocks. But they came through it in the end, and that is an enormously positive sign for a team previously written off as bottlers. They will face stronger teams than Japan, no doubt, but they, along with Colombia, have put themselves in pole position to qualify for this group by performing when they needed to. With Greece looking very mediocre against Colombia and Japan now beaten, could this finally be the time the Golden Generation fulfils its promise at the World Cup? One more win should seal it.